A little experiment is under way with a new Facebook page for RCIA catechists, candidates, inquirers, seekers in Glasgow. Just a place to share experiences and good practice. Click here or seach 'Glasgow RCIA' on Facebook to check it out. Our annual conference for RCIA catechists took place on 31st October 2016 at St. Joseph's, Tollcross. We looked at using Matthew's Gospel (Year A) providing some introductory comments to the Gospel and then specifically at applying Matthew's Gospel to Year A and the implications of the September-Easter Program. Other inputs focussed on relating to the Rite itself and to augmenting our celebration with appropriate musical responses. Some of the files used are available here for your perusal. One of the needs catechists often flag up to us is to have reflection material available for use out with the annual conference for catechists. Hopefully some of the files below will begin to meet these needs and keep those unable to attend the conferences in the loop. 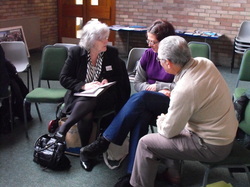 Our annual conference for Catechists took place on Saturday 27th October 2012. Over the next few days, some of the workshop materials will appear here and links to other videos and websites. We highlighted some of the documents available to consider during the Year of Faith. Sacrosanctum Concilium and Lumen Gentium are available on the Vatican website. Click on them here to be taken directly. Thanks to Ellen McBride (keynote speaker) for providing us with her presentation which can be viewed below. In evangelising, we considered some of the tools available to us through social media websites. Here are a few to get started (have a look at the 'Multimedia for RCIA tab on the left also). There are a variety of useful websites and documents available online, so this list includes only some recomendations of helpful sites and publications. (you will need adobe acrobat reader from www.adobe.com to download these files). Sunday 9th March 2014 Rite of Election (St. Andrew's Cathedral) 3 p.m. PLEASE NOTE THAT CANDIDATES AND CATECHUMENS WITH THEIR SPONSORS, SHOULD REPORT TO THE CURIAL OFFICES NO LATER THAN 2.30 P.M.
Sunday 8th June 2014 Mass for Neophytes: St. Andrew's Cathedral 3 p.m.
For more information about these events or to register, please email liturgy@onetel.com. Catechists have a responsibility to update their own understanding of the Faith and the teachings of the Church. The Archdiocese of Glasgow offers a an award course in Catholic Theological Education. The course lasts for two years and is taken on a part time basis. For further information on the course, click here. Subscribe to our catechists' mailing list by completing the form below. Please include the name of your parish in the comment box.